Building Regulations Part L sets the minimum standards for energy performance of new and existing buildings. In the latest changes to Part L, a mandatory (FEES) Fabric Energy Efficiency Standard has been introduced in addition to the original (TER) Target Emission Rate which measures CO². The FEES target puts focus on the thermal performance of the building fabric i.e. walls, floors, roofs and the materials / components that make these elements up. 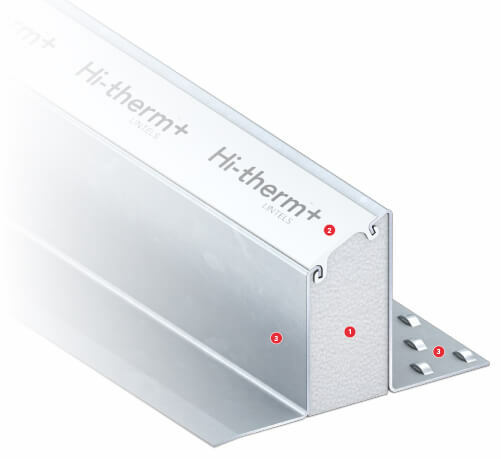 Lintels are in most cases the most significant thermal bridge, meaning lintels can have an important impact on the overall thermal performance of a building. Insulation: Pre-fitted expanded polystyrene insulation enhances the thermal performance of the lintel. Polymer Thermal Insulator: Rigid polymer thermal insulator acts as an effective thermal break. Galvanised Steel: Galvanised steel inner & outer leaf.